This guide will explain the process of generating the CSR and installing the SSL Certificate on Mac OS X EI Capitan server quickly without making any mistake or error. Let’s discuss them one by one. From your MAC system, open the Server App (From Finder window, click on Applications under the favorites, and then click on Server App). Here, you need to select the MAC server for which you are looking to generate the CSR. Then, add the System Admin credentials and click on Allow. Select the Other Mac and click onthe Continue button. Here, you need to add the Host/Name or IP Address of the Server. The, add the System Admin Credentials and click on Allow. Now from the Server App, click on Certificates under the Server option. Click on + > Get a Trusted Certificate and then click on Next button. One by one add the required details. Now, click on Next to generate the CSR. CSR information displayed on your screen. Click on Save button and give a preferable path to save the CSR file. Note: Before you start the SSL installation process, make sure to complete the SSL Certificate Issuance process and verify all the SSL certificate files provided your Certificate Authority. Save these files into a specific location. Here, we will first install the intermediate certificate, then SSL certificate and finally we will assign the SSL to the services. In the Keychain Access window, click on System under the Keychains. Add the Administrator Password and click on Modify Keychain, this will authorize the changes. Select This Mac – Server name and click on Continue. Add the Administrator Account Name and Password and click on the Allow button. Add the Hostname, or IP address click on the Continue button, then add the Admin Account Name & Password and click the Allow button. Double click on the pending Certificate which created during the CSR Generation process. You can find the “Drag files received from your certificate vendor here” box. Here, from the Secure services using select Custom. Service certificates window will appear, here you need to select the new certificate for each service you wish to assign. Once you complete the selection, click on the OK button. 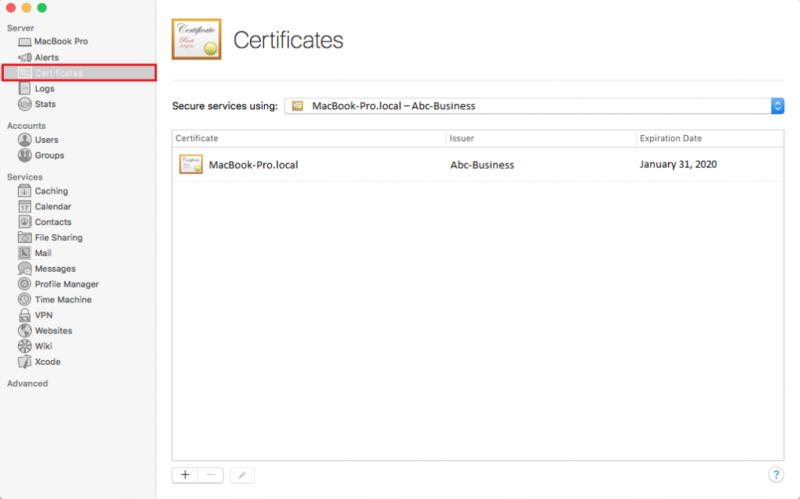 Finally, you have generated the CSR and Installed the SSL Certificate on the MAC OX EI Capitan Server.